We all know that Ladbrokes are dodgy as f**k, but, even tjhey are surpassing themselves with a scam that is straight out of Donald Trump/Vladimir Putin play book and start to create fake news and fake videos. They have sponsored a video in which some cretin claims to have a system for winning at Ladbrokes fixed odds betting terminals (FOBT). Clearly the question that immediately pops out…why only Ladbrokes? If you could rip off Ladbrokes you could rip off all the other bookmakers. So this say to me it is a ruse to get gamblers who are easily led to use Ladbrokes like the time they sent me a link to play on their casino website, if you lose they will replace the £10. The only problem being the link goes to another Ladbroke casino website which does not support the £10 refund. 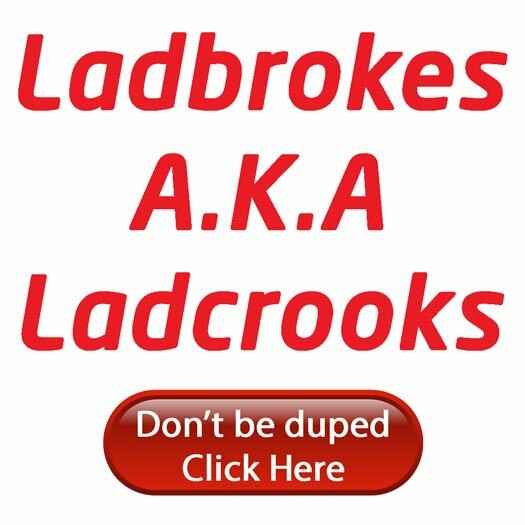 Do not use Ladbroke and watch out for fake videos, emails, text messages, tweets etc offering unbelievable promotions from the worst bookmakers in the World. PokerKnave's Blog bets, betting, Ladbrokes, ladcrooks, scam, video. permalink.